The canyon in the Beşkopnak neighborhood of the Mediterranean province of Antalya’s Manavgat district is located on a 36,600-hectare area with over 100-meter-high walls and 14-kilometers-long streamline. Rafting in the Köprülü Canyon can be done in two-person canoes or boats with a capacity of eight to 10 people by any enthusiast from any age group, without the need for any extra talent. A brief training, a helmet, a lifejacket, and an oar are enough to go rafting in the canyon. 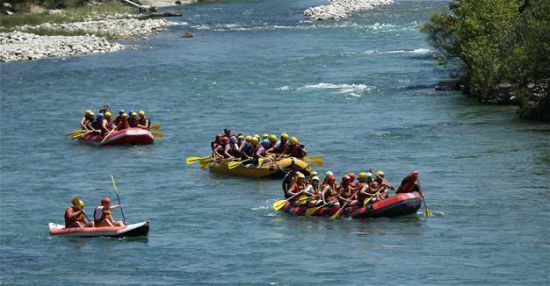 The head of the Köprülü Canyon Tourism Development Cooperative, Refik Armağan, said rafting activities started in the beginning of 1990 in the Köprüçay Stream – from where the canyon also takes its name, which begins from the Taurus Mountains and flows into the Mediterranean Sea. 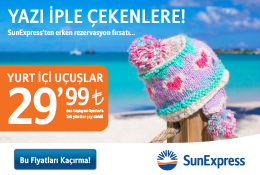 “This season, especially Turkish tourists, Russian and Arab tourists are showing great interest to our rafting activities. We are having a quite lively season. Last year, no more than 2,000 people were rafting here on a daily basis, but this year we are hosting 10,000 people every day for rafting. By the end of this year’s season, we expect to welcome about 700,000 people in total to our canyon,” he noted. The rafting season in the canyon starts mid-March and lasts until mid-November in accordance with good weather over the Köprüçay Stream in the region. “Tourists from neighboring districts, including Kemer, Alanya, Belek and Side, are taken from their hotels in the morning at around 9 a.m. and brought to Köprülü Canyon. We have guides for every language. They firstly give an introduction to tourists. Once visitors wear their helmets and lifejackets, we take them on the boats and head to the starting point of the rafting,” Armağan said. “The rafting insurance covers people between the ages six to 65, but if anyone who is 70 also wants to join, we accept him in return for his or her signature. Our rafting track is a third degree track, which means it is quite easy to go rafting on it. We even have visitors rafting with wheelchairs,” he added. Roughly 50 rafting agencies offer services in the region. The highest season is between the summer months of July and August, according to representatives from these agencies. In addition to three-and-a-half hours of rafting services, tourist agencies also provide a variety of animations and games in water to entertain tourists before and after rafting.